Viewing topic "Motif Rack (Classic) with Yamaha CP 300"
If SONG or PATTERN mode = you can play 4 MIDI Channels (how many sounds that is depends on your MIDI channel assignments within the MIXING setup..
Hello all, First post but I have been lurking around this forum for a while now. Thanks to all of you for the valuable information. Now I just recently purchased a brand new Yamaha CP 300. I also purchased a used Motif Classic Rack, specifically for Power Grand :), to use along with the CP 300. I’ve taken a quote from (Mr. Phil) Bad Mister because what he describes is exactly what I would like to do with my setup. I have read through both manuals for each device but I am at a loss. What I am trying to do is the following. I have setup a Performance in the Motif rack with 4 different voices. I have the CP 300 set to Master mode with each of the 4 zones set to midi channels 1-4. So Zone 1 is set to midi ch1 Zone 2 to midi ch 2 and so on. If I move any of the Zone sliders from the keyboard I can see that the Motif rack is receiving the signal. Even the volume faders on the Motif rack (Performance Edit page) will move. However I only hear sound from the first Voice in the Performance. Any ideas what I’m doing wrong? the mode on the Motif Rack that allows you to receive on four (actually 16) separate MIDI channels is called MULTI mode. So place the four Voices you want to play in the first four PARTS of a Motif-Rack MULTI and make sure that PART 1 = Ch 1, PART 2 = Ch 2, PART 3 = Ch 3 and so on. Thank you Bad Mister for your reply. I have setup both the Motif Rack and CP 300 in the way that you have explained. However I am still unable to hear each of the sounds that I set up in the performance. I can however see that the motif rack is receiving on each of the four zones of the CP 300. Are the Parts in each Multi automatically assigned to its respective midi channel? And if not how can each parts midi channel be changed? Thank you Bad Mister, I did find the section in both the CP 300 and Motif Rack manuals about multi edits and the Master Mode. I have now assigned the first four parts to midi channels 1-4 respectively and the Motif Rack’s basic receive channel is set to Omni. I have control over each part e.g. I can move each Zone fader for the CP 300 and it affects the volume for each part of the Motif Rack however I only hear sound from the first part (midi channel 1). I feel that I’m missing something so simple. The Motif-Rack’s Basic Receive Channel should be set to 1, not Omni. This has nothing to do with your setup up because when you are in MULTI mode each PART is set individually to receive on a MIDI channel. The “Basic Receive Channel” is to address the entire Motif-Rack, as in when you want to send a message to change the Multi from 001 to 002. If you are only hearing one sound, you have to make sure your Zones are active in the CP300. Review the parameters for each Zone. Ever figure that out? I have the same problem. CP300 & XS-Rack. I’ve read both manuals and it seems like I’ve done everything correctly but sound only triggers the XS from channel 1 (or whatever channel I have zone 1 set to). I’m in master mode and have tried every possible configuration of the settings I can think of. Like the original post, I can see midi data being received by the flashing of the rack LED but no sound. I’m just trying to have the CP internal sound trigger on zone 1 (midi channel 1), and the rack receive on zone 2 channel 2. Motifator member drumtek101 last posted here May 24, 2015, and apparently got a Motif XF8 in 2013, so likely won’t reply to your question. 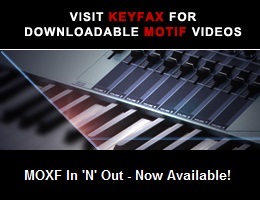 Speaking of which models are owned, your member profile indicates the Motif XF and Motif XS, but not the Rack XS. That seems to not agree with your post - please correct your profile, since it helps us to help you if it’s accurate. I have the same problem. CP300 & XS-Rack. I’ve read both manuals and it seems like I’ve done everything correctly but sound only triggers the XS from channel 1 (or whatever channel I have zone 1 set to). I’m in master mode and have tried every possible configuration of the settings I can think of. Like the original post, I can see midi data being received by the flashing of the rack LED but no sound. If you set the CP300’s MIDI Transmit Channel (MidiOutChannel) to Ch 2 (Master mode not engaged), can you play the Voice in the Rack XS Multi that’s set to receive on Channel 2? Yes, that works as well as any other midi channel I choose. I’m not quite ready to break out one of my MFC1’s yet, but this is definitely puzzling. OK, that would seem to indicate the problem isn’t at the Rack XS end. Your profile shows that you have a Motif XF. Have you tried using it in Master mode to drive the Rack XS? If so, does that work correctly?